It’s graduation season. And I’ll bet you can feel it. Maybe your own child or loved one is finishing up school or moving on to new stage in their lives. Or maybe you’re reminiscing about your own graduation and what a magical time it was. Or maybe you’re experiencing some other transition – something in your life is turning into something else. I’m kind of going through all of those things right now. This weekend, our older son Preston will graduate from St. Edward’s University with an MBA in digital media management. Preston is a wonderful young man. He’s worked very hard and done extremely well. We’re both very proud of Preston’s success. Preston at 2 or 3, obviously surveying his future. We’re also proud that our niece, Jenna, will walk the stage and graduate from UTSA this Saturday. All in all, a big day for Watsons picking up sheepskins. For those keeping track, our younger son, Cooper, is doing great at Baylor and will graduate in a couple of years. 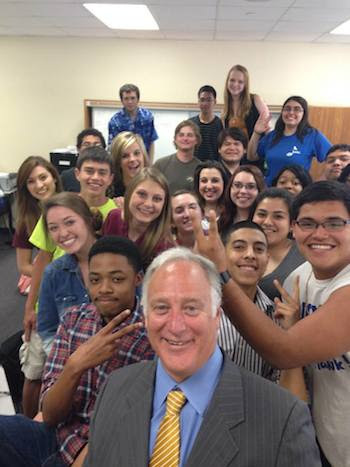 Last week, I returned to Boswell High School, which I graduated from in 1976. 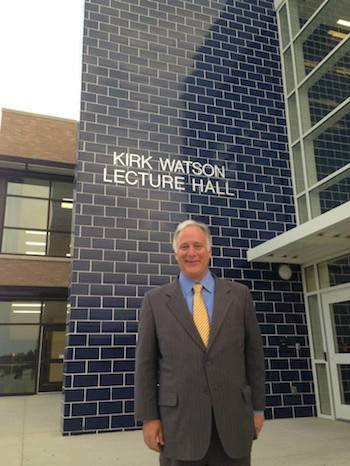 I was there because the school named a lecture hall after me, which is a really phenomenal honor. That school, and the people who comprised it, had a lot to do with making me who I am today. And it’s still a special place. The school board president (a great old friend from back at BHS) pointed out that I started my political career at Wayside Middle School when I became student body president. So I guess Wayside and Boswell get the credit (or blame, some days). I had a great time as president of my class all through high school, and president of the student body my senior year. The Watson Wire is growing up, too. You know, I started the Watson Wire about eight years ago. I wanted a way to chat with folks, help you all get to know me and tell stories about life in the Capitol and around Austin. I started blasting it out once a week, and it caught on pretty well (at least, well enough that I couldn’t stop). This was before Twitter, back when Facebook was still a baby. Now that I’ve become a little, well, addicted to those platforms, I think there’s a new and better role for the Watson Wire to play. From now on, the Watson Wire will be a little less frequent and a little more immediate. I’m going to try to send it when there’s something important going on or there’s something I need to share. So when it hits your inbox, it’ll be because there’s something important you need to know – not just because it’s Tuesday. And just for the record, I’ll occasionally need to share a funny or interesting story about something that’s happened or is happening around here. I’m very proud that the Watson Wire hasn’t been just some political bulletin with warmed-over talking points. I’m not going to turn it into one now. So I hope you’ll keep reading. And I hope you’ll keep watch over my Facebook and Twitter feeds for regular updates on Texas’ school finance mess, my kids’ extracurricular activities, or whatever else. I’ve thoroughly enjoyed keeping in touch with you all. I have no intention of stopping.